The purpose of this document is to provide step by step usage examples of the import and export features found in Audit Master 3. This document is intended to demonstrate the exportation and importation of audit files created by Audit Master 3 only. It does not apply to the importation of alternate or unrelated “.mdb” database files. System users must have the appropriate Audit Master 3 access rights in order to access the import and export features inside Audit Master 3. Those who are members of the “View Only” group will not be able to utilize the import and export features of the program. Users must also have Windows access rights to read, write, and modify the database file if it exists anywhere other than their local pc. 1. Open Audit Master 3 and login to your database normally. Run any necessary query to display a list of your audits on the audit list screen. 2. Click on any audit in the audit list so that it becomes highlighted as shown below. 3. 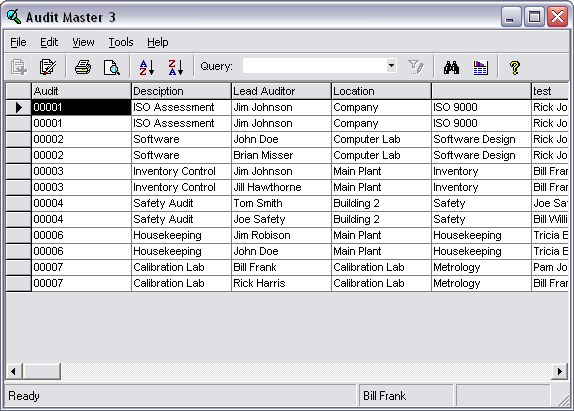 Next, click the “Tools” option at the top of the Audit Master window. 4. Click the option called “Export Audit.” The “Create Export File” window will open as shown below. 5. Select the directory in which you wish to store your newly exported audit file via the “Save in” dropdown box at the top, then type in a file name in the “File name” field and press the “Save” button. After saving the file, you will see your newly exported audit file in your chosen directory. By default, it will have an “.mdb” file extension. 1. 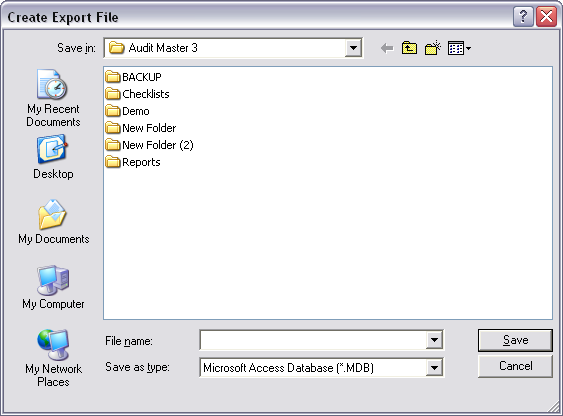 Open Audit Master 3 and login to your database normally. 2. 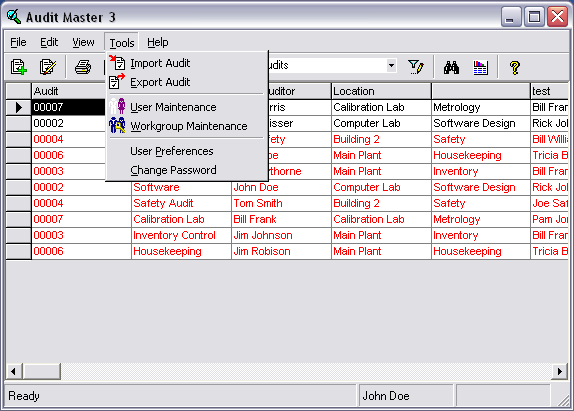 While on the audit list screen, click the “Tools” option at the top of the Audit Master window. 3. Next, click the option to “Import Audit” in the dropdown “Tools” menu. 4. The “Select File to Import From” window will open as shown below. From this window, you will be required to navigate to the exported audit file in which you wish to import. 5. After selecting your file, press the “Open” button in the “Select File to Import From” window. If you receive any dialog boxes asking if you wish to import the selected file, press the “Yes” button. You may be asked if you wish to overwrite, or “merge” with an existing audit. Click the “Yes” button if you wish to merge the audit or click “No” to create a separate audit. 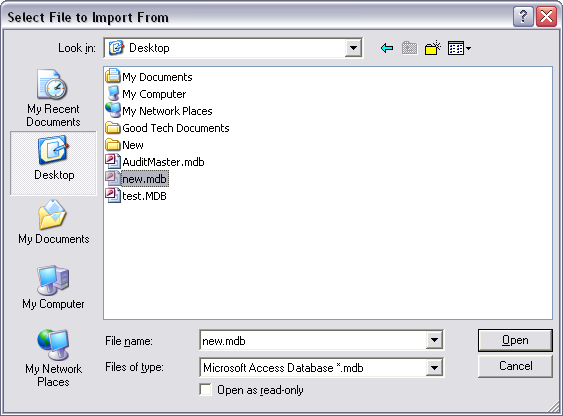 The import and export processes can be very helpful as well as time saving if there are instances of more than one user per copy of Audit Master 3. These features also allow users to share data between multiple audit databases.